National Treasury announced an increase in the limits for offshore investments by collective investment schemes, investment managers and long-term insurers from 35% to 40%, and an increase from 5% to 10% for investment into Africa. It is this allowance that CIS Managers use in their funds that have offshore exposure, including rand-denominated feeder funds, and explains why Managers are required to close their feeder funds to new investments when the allowance has been exceeded. Importantly, this change to the offshore investment allowance also has the effect of immediately changing Regulation 28 of the Pension Funds Act, which sets the asset allocation limits for individual retirement funds. As a result, the maximum offshore exposure for a Regulation 28 fund will increase to 30% and 10% to Africa. This is to be welcomed as research has shown that for many investors, the optimal allocation to offshore assets is more than the somewhat arbitrary 25% previously allowed in terms of Regulation 28. BNP Paribas illustrated that for real return mandates from inflation plus 4% a strategic allocation of at least 28% to foreign assets, rising to 50% as the required return above inflation rises, is optimal. Source: BNP Paribas 4Q 2015. While the optimal strategic allocation to foreign assets will depend on each investor’s personal circumstances, risk profile and longer-term financial planning objectives, the evidence suggests that, for many, it is at least a third of their assets. Interestingly though, many institutional investors have not reached the current limit of 25%. This is evidenced by considering that the offshore exposure of the average multi-asset high equity fund is substantially underweight this limit at approximately 15%1 (and exposure to Africa is negligible). Therefore, while this additional flexibility is to be welcomed, it appears that many institutional investors still favour South African-domiciled assets – which may themselves derive differing degrees of offshore revenue. The Investec Opportunity Fund, by contrast, is at maximum offshore exposure, as high quality global equities remains portfolio manager, Clyde Rossouw’s favoured investment. These shares represent a balance between old economy staples like Nestlé and Johnson & Johnson, and exciting higher growth opportunities like Visa and Priceline (the owner of Booking.com). What these businesses have in common, apart from their prodigious cash generation and exceptional returns on capital, is an ability to grow with a lower dependence on the economic cycle than the average business. The Investec Equity Fund is also different! While not strictly a fair comparison as a number of equity unit trusts funds have domestic-only mandates, it is interesting to note that the Investec Equity Fund currently has 19% invested in offshore assets. This is because, even though South African exposed equities (banks and retailers) are currently offering a great investment opportunity (thanks to our positive political developments and foreign investors looking favourably at South Africa again), we focus on building a well-diversified equity portfolio with a combination of the best opportunities available to us. Co-portfolio manager of the Investec Equity Fund, Hannes van den Berg explains: “The South African FTSE/JSE All Share Index is a small and narrow Emerging Market index relative to global Developed Market indices. Having exposure to global equities gives the fund access to unique opportunities not available in our local market, which complements the investments already in the fund. 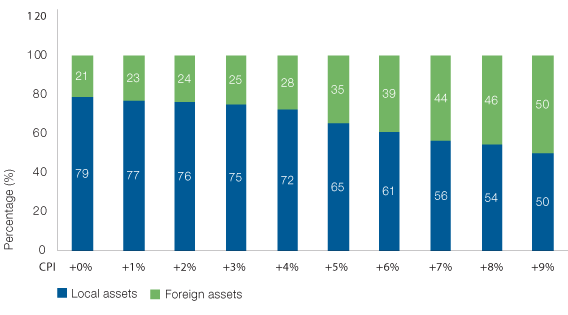 How can investors access offshore investments? Given that almost 50% of all investments into unit trusts are in multi-asset funds, this suggests that investors need to look elsewhere to ‘top-up’ their offshore investments. Foreign-domiciled global funds, such as the Investec Global Multi-Asset Income Fund, Investec Global Strategic Managed Fund and Investec Global Franchise Fund. By doing so, investors invest directly into a FSB-approved offshore fund in its dealing currency e.g. dollars, pounds or euros. When disinvesting, investors will then also receive the proceeds in the fund’s dealing currency. As one of the first asset managers to have built a global firm from emerging market origins, the journey of our business has uniquely prepared us to navigate a rapidly evolving world. Our global approach, combined with a footprint in emerging and developed markets, enables us to find the best investment opportunities for our clients. Investec’s rand-denominated feeder funds can be accessed directly from Investec and via Investec Investment Management Services (IMS), or through most of the linked investment service provider (LISP) companies in South Africa. Similarly, our foreign-domiciled funds can be accessed directly, via the IMS GlobalSelect platform or through other LISP companies’ offshore fund platforms in South Africa. 1Source: Morningstar Asset Allocation report, 31.01.18. All information is as at 28.02.18 unless stated otherwise. All information provided is product related, and is not intended to address the circumstances of any particular individual or entity. We are not acting and do not purport to act in any way as an advisor or in a fiduciary capacity. No one should act upon such information without appropriate professional advice after a thorough examination of a particular situation. This is not a recommendation to buy, sell or hold any particular security. Collective investment scheme funds are generally medium to long-term investments and the manager, Investec Fund Managers SA (RF) (Pty) Ltd, gives no guarantee with respect to the capital or the return of the fund. Past performance is not necessarily a guide to future performance. The value of participatory interests (units) may go down as well as up. Funds are traded at ruling prices and can engage in borrowing, up to 10% of fund net asset value to bridge insufficient liquidity, and scrip lending. A schedule of charges, fees and advisor fees is available on request from the Manager which is registered under the Collective Investment Schemes Control Act. Additional advisor fees may be paid and if so, are subject to the relevant FAIS disclosure requirements. Performance shown is that of the fund and individual investor performance may differ as a result of initial fees, actual investment date, date of any subsequent reinvestment and any dividend withholding tax. There are different fee classes of units on the fund and the information presented is for the most expensive class. Fluctuations or movements in exchange rates may cause the value of underlying international investments to go up or down. Where the fund invests in the units of foreign collective investment schemes, these may levy additional charges which are included in the relevant Total Expense Ratio (TER). A higher TER does not necessarily imply a poor return, nor does a low TER imply a good return. The ratio does not include transaction costs. The current TER cannot be regarded as an indication of the future TERs. Additional information on the funds may be obtained, free of charge, at www. investecassetmanagement.com. The Manager, PO Box 1655, Cape Town, 8000, Tel: 0860 500 100. The scheme trustee is FirstRand Bank Limited, PO Box 7713, Johannesburg, 2000, Tel: (011) 282 1808. Investec Asset Management (Pty) Ltd (“Investec”) is an authorised financial services provider and a member of the Association for Savings and Investment SA (ASISA). A feeder fund is a fund that, apart from assets in liquid form, consists solely of units in a single fund of a collective investment scheme which levies its own charges which could then result in a higher fee structure for the feeder fund. The fund is a sub-fund in the Investec Global Strategy Fund, 49 Avenue J.F. Kennedy, L-1855 Luxembourg, Grand Duchy of Luxembourg, and is approved under the Collective Investment Schemes Control Act.